Francis Kingdon-Ward, born Francis Kingdon Ward (6 November 1885 in Manchester – 8 April 1958) was an English botanist, explorer, plant collector and author. He published most of his books as Frank Kingdon-Ward and this hyphenated form of his name stuck, becoming the surname of his wives and two daughters. It also became a nom-de-plume for his sister Winifred Mary Ward by default. Son of Harry Marshall Ward and Selina Mary Ward, née Kingdon; he went on around 25 expeditions over a period of nearly fifty years, exploring Tibet, North Western China, Myanmar and Assam (now part of North Eastern India). In Myanmar he met and conducted some research into forestry and plants in the country with native botanist Chit Ko Ko. Among his collections were the first viable seed of Meconopsis betonicifolia (Himalayan blue poppy, first discovered by Pére Delavay), Primula florindae (giant cowslip, named after his first wife Florinda, née Norman-Thompson) and Rhododendron wardii, a yellow flowered species. A species of lizard, Calotes kingdonwardi, is named in his honor. He is also commemorated in Ward's trogon, Harpactes wardi. He survived many accidents on his expeditions including being impaled on a bamboo spike, falling off a cliff (stopped by a tree growing from the cliff), lost for two days with no food, tent crushed by a tree in a storm, and he was close to the epicentre of an earthquake (registering 9.6 on the Richter magnitude scale) on 15 August 1950 during an expedition in Assam. In addition to his professional activities as a botanist, in the 1930s Kingdon-Ward also served as a spy for the British India Office. In 1935, Kingdon-Ward was arrested by Tibetans after he crossed the Sela pass into the Tawang tract ( now Tawang District of Arunachal Pradesh, India) despite being refused permission to do so by the Tibetan authorities who were then administering Tawang. Tibetans protested this violation of their border to the British mission then visiting Lhasa. Kingdon-Ward was quickly released, but this incident led the British to investigate the status of the border, and it was discovered that the entire Tawang tract had been ceded to British India by Tibet by the Simla Convention negotiated by Sir Henry McMahon with the Tibetans in 1914. In 1923 he moved to Hatton Gore, a big house on the east side of Hatton Road, Hatton, London; the site of the house is now under the east end of London Heathrow Airport. He built there a big rockery looking like a bend in a river ravine in the Himalayas. He sold the house due to a loss that he made running a plant nursery business. He was married twice, first to Florinda Norman-Thompson on 11 April 1923; later, to Jean Macklin, on 12 November 1947, to whom he remained married until his death. Florinda Kingdon-Ward had a brief political career which included standing as a Liberal Party candidate for Parliament at the 1950 UK General Election in Lewes. 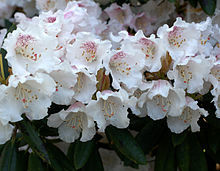 Even towards the end of his career he was still active, his greatest "swansong" plant was probably Lilium mackliniae, found jointly with his second wife after whom it is named. At age 68 he climbed to over 1,730–2,590 metres (5,680–8,500 ft) above sea level in the Ukhrul district of Manipur, India (near the boundary of Myanmar to the east) and was still discovering new species of plants on his last expedition in 1956, including Roscoea australis, the most southerly representative of its genus. Frank Kingdon-Ward died on 8 April 1958 aged 72. He had suffered a stroke and went into a coma from which he never recovered. He was buried in the churchyard at Grantchester. His sister, Winifred Mary Ward, was a founder of the Royal College of Speech and Language Therapists and wrote several books on speech therapy. The standard author abbreviation Kingdon-Ward is used to indicate this person as the author when citing a botanical name. ^ Based on his 25 published books. Some expeditions blurred into each other, hence the ambiguity about the exact number of expeditions. ^ Beolens, Bo; Watkins, Michael; Grayson, Michael (2011). The Eponym Dictionary of Reptiles. Baltimore: Johns Hopkins University Press. xiii + 296 pp. ISBN 978-1-4214-0135-5. ("Kingdon-Ward", p. 141). ^ Lamb, Alister (1986). British India and Tibet, 1766–1910. Routledge. p. 418ff. ISBN 0-7102-0872-3. ^ "Frank Kingdon-Ward timeline of events in his life". french4tots.co.uk. ^ "UK General Election results: February 1950 [Archive]". politicsresources.net. ^ "Review of The Land of the Blue Poppy: Travels of a Naturalist in Eastern Tibet by F. Kingdon Ward". The Athenaeum (No. 4473): 66. 19 July 1913. ^ Davies, H. R. (September 1921). "Review of In Farthest Burma by Captain F. Kingdon Ward". The Geographical Journal. 58 (3): 230–232. This page was last edited on 16 November 2018, at 11:28 (UTC).